Dolphins start communicating from birth by squawking, whistling, clicking and squeaking, according to National Geographic. Members of a pod sometimes vocalize in varying patterns simultaneously, much like people holding different conversations at a party. Dolphins are intelligent mammals that team up in groups called pods to perform tasks. Aside from verbal communication, dolphins also communicate non-verbally through jaw claps, bubble blowing, fin caresses and other body gestures. Scientists believe that dolphins talk about many things, such as their age and emotional state. They also call for help when they need backup in tough situations. For example, a spotted dolphin who was bulled by two bottlenose dolphins the previous day came back the next day with a few friends to chase away the bottlenose dolphins, says Denise Herzing, who studies dolphins in the Bahamas. 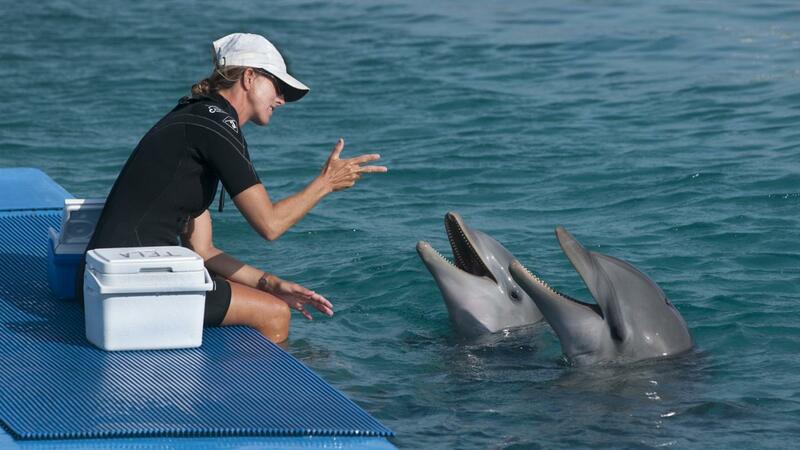 Dolphins talk in a distinct way, although they don't have vocal cords, according to PawNation. They use special "lips" in their nasal passages to produce sounds. Pushing air through these lips causes the tissues to vibrate, forming sounds at varying frequencies. Dolphins produce different noises in patterns similar to words in human languages, although scientists have not yet been able to decode their language fully. Each dolphin has a "signature whistle" that makes it unique from other dolphins. This special vocalization allows dolphins to identify other dolphins without sight. How Many Babies Do Dolphins Have? What Are the Predators of Dolphins? Is a Dolphin a Carnivore, an Herbivore or an Omnivore?